God's word begins with the tree of life and the tree of knowledge watered by a river nourishing Eden. As it ends with the image of a tree by a river appearing in heaven, the redeemed who have stood as ""a tree planted by streams of water, bringing the fruits of the spirit, and birds and animals of every kind find shelter"" are healed by its leaves. In the ecology of trees, we find the believer, rooted in living water, lifting to the heavens, sheltering others, and bearing fruit. From communities of pines and oaks of the North American continent, to the solitary baobab silhouetted on the African savannah, to the restoration of Israel's cedars in Asia, trees are being felled under a darkening warfare to silence God's words. Every year an estimated 100,000 Christians die for their faith. Hundreds more suffer loss of home and jobs. Churches burn and worshippers are slaughtered. Jesus is being argued in the courts and classrooms. His believers are imprisoned and beheaded. Our Trees of Life combines the tangible world of trees around us with an image of God's concern for us in a world increasingly hostile to his word. 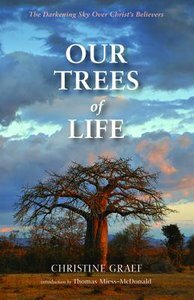 ""Like the eagle that perched atop the Great Tree of Peace to scream out warning as enemies approached to disturb the Great Peace, Christine Graef's book, Our Trees of Life, screams out a warning, not only to America, but to the world."" --Willie Jock, Pastor; Bear Clan, Akwesasne, Mohawk Nation Territory ""Does our Creator God reveal Himself and communicate His messages to mankind by using trees? In this fascinating and illuminating book, author Christine Graef presents enlightening evidence that God does indeed work in obvious, yet mysterious, ways. This is an eye-opening read!"" --Thom Miess-Mc Donald, Great Peace Native Fellowship of Canada and USA Christine Graef is author of Mending the Broken Land: Seven Stories of Jesus in Indian Country (2014) and Journey to the Edge of the Woods: Women of Cultures Healing From Trauma (2015). She lives by the St. Lawrence River in upstate New York. About "Our Trees of Life: The Darkening Sky Over Christ's Believers"
Christine Graef is author of Mending the Broken Land: Seven Stories of Jesus in Indian Country. She lives at the edge of the woods by the St. Lawrence River in upstate New York.